Rev. Carl J. Stratman, CSV, a scholar and educator, died Jan. 10, 1972 of a heart attack. At the time, he was in Pasadena, CA, on leave to continue his research studies at the Huntingon Library. He was 54. Fr. Stratman was born Dec. 19, 1917 in Detroit. His family moved to Chicago when he was just beginning school, but he left to spend eight years with the Discalced Carmelites at Mount Carmel College in Niagra, Ontario. He passed from the order’s juniorate to the novitiate and made his first profession in 1936. In 1939, however, he was refused authorization for perpetual vows and returned home. Still longing to become a priest, he contacted the Rev. Richard J. French, CSV, the new Viatorian provincial. Thus began a long and personal friendship. Under the guidance of Fr. French, he completed college in June, 1940 at De Paul University in Chicago with a major in English and minors in history and philosophy. In July of the same year, Fr. Stratman entered the Viatorian novitiate in Lemont, IL. 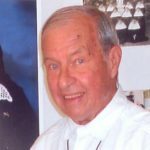 He professed his first vows on Aug. 15, 1941 and his perpetual vows on Aug. 26, 1944, before he was ordained to the priesthood on Sept. 24, 1944 in Peoria. His studies didn’t end there. Fr. Stratman earned his master’s degree in 1943 and his doctorate in 1947 — both in English — from the University of Illinois in Champaign. He also studied theology at Catholic University of America in Washington DC and earned a second master’s degree in 1945, in dramatics. From 1947 – 1949, Fr. Stratman taught English and religion classes at Fournier Institute in Lemont. In 1949, he began teaching English at Loyola University in Chicago, where he rose through the faculty ranks and was a professor at the time of his death. His concentration was on the promotion and prosecution of research. Summers were spent in prestigious libraries, where he researched and wrote numerous books and scholarly articles. Fr. Stratman spent weekends ministering at St. Bartholomew Parish in Chicago. It turned out to be a part of his life for decades and enabled him to spend time with his mother. He also held several responsible positions in the Viatorian Community over the years. Vigil services were held Jan. 12, 1972 at Theis Funeral Home in Chicago, where his close friend, the Rev. M.J. O’Brien, CSV, preached the homily. The funeral Mass took place Jan. 13, 1972 at St. Viator Church in Chicago. The Rev. 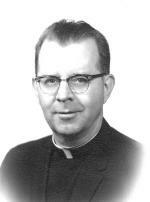 Edward C. Anderson, CSV, Viatorian provincial, was the main celebrant and four Jesuit priests from Loyola University were concelebrants. The Rev. John J. Milton, CSV, gave the homily. In addition, officials at Loyola University held a memorial Mass for Fr. Stratman, on Jan. 21, 1972 at Madonna Della Strada Chapel, which drew a delegation of Jesuits, Viatorians and lay faculty from the university to attend. Burial took place in the Viatorian Community plot at Queen of Heaven Cemetery in Hillside, IL.